The Pacer Vintage reminds us what it’s like to have fun playing the guitar. What’s the fun in jamming out if you can’t have a big ear-to-ear grin going across your mug? LOL! You say you’re in to the dweeby math-rock or that you’d rather be staring at your shoes while you play? There are other guitars for that. Those interested in the high-octane party of laying down smokin’ hot riffs can look to the Kramer Pacer Vintage. A double-hum configuration has been a staple of the electric guitar for over 60 years. In the 80s, Kramer has the Pacer Imperial and the Focus 2000 import to fill the demand. Nowadays, Gibson-owned Kramer keeps the Pacer line going with the Pacer Vintage and the entry-level Pacer Classic. What are the main differences? The Pacer Vintage comes decked out with higher quality electronics and hardware. My Pacer Vintage came to me directly from Gibson’s Nashville warehouse, although made abroad. Out of the box, the Pacer Vintage comes stock with a pair of humbuckers from the Seymour Duncan company connected to independent push-pull pots for series-parallel operation and a treble-bleed mod. And it’s a Kramer, so you can bet there’s a barrel jack and a 3-way mini-toggle. HaHa! 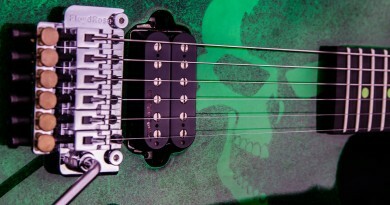 The bridge is a black OEM-level Floyd Rose 1000 series double-locking tremolo system. This is the Korean-made Floyd that is closest in quality to the original German, and superior to the Floyd Rose Special. You should be happy you have it on this guitar for this pricing. This guitar came with 10-46 strings, tunes in E standard. The Pacer Vintage takes that gauge well, and that’s where I’ve kept it with no issues. 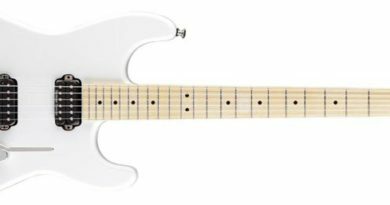 The maple neck has a 12″ radius maple board with a 25-1/2″ scale and 22 medium-jumbo frets – imagine the Dunlop 6130 size. There is a R2 nut, putting the Pacer Vintage at the same spec as most 80s Kramers. The “beak” headstock hearkens to the earlier days prior to the hockey stick that Kramer is more well-remembered for having. A good thing about the Pacer Vintage are the body’s curves. It’s a lot more comfortable than a lot of the “soloist” style, harder-edged bodies on the market. The round-over along the edge to the tummy cut to the forearm contour… it’s all makes the guitar easier to handle over long stretches. The vibe of the Pacer Vintage works out well. It has a little bit of all the flavors that you are used to playing. It comes in some fun colors, too. And as is the case with the Kramer The 84 model, the Pacer Vintage takes modifications like a champ. I’ve put a German Floyd Rose on mine, along with many of the genuine Floyd Rose upgrades. Many of the pickups you read about on these pages have been through the Pacer Vintage. 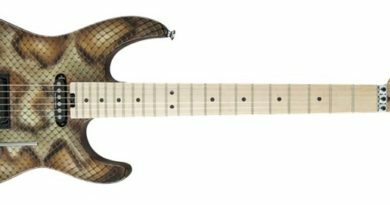 For reference, this Kramer Guitars Pacer Vintage Model evaluation was conducted with a Fractal Axe-Fx II XL+ featuring Celestion Impluse Responses and Fractal MFC-101 MIDI Foot Controller. Real cabs used were Marshall 1960B cabs loaded with Celestion Vintage 30s and G12M Greenbacks.